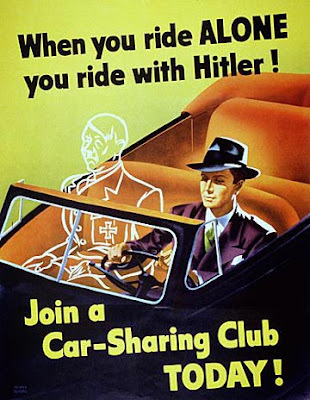 OK, first, the picture on the left is from an American poster during WWII that I found humorous. Reading this book reminded me of this poster—it felt like a propaganda piece, although it was more of a Cold War propaganda piece. But that confused me, because Orwell didn’t strike me as the type to write Cold War propaganda. So I read his bio and found out he was a Socialist. This too was odd in a different way, since the book reams Socialism a new one (although the main character, Winston Smith, admits that the form of Socialism practiced by “The Party” is a perversion of the original Socialist idea). So I was left considering whether the whole thing was some kind of satire making fun of people’s Cold War paranoia, but the thing is…it isn’t. Unless it flew right over my head. I think the book was meant to be deadly serious. OK, so not having read any analysis of this book, that was my take on it. Those of you who have may commence with the “Of course it was a satire, Jen” posts. Or not. That's a really creepy picture, Jen. the first time I read this book, I didn't know anything about politics or political history. I know only slightly more now, so I'm sure a ton of this went over my head as well. I've got a lot of work to do in the way of research for our book club. And I agree with you, I think it's deadly serious. What'd you think about the ending? And now that you've finished it, how do you like the little 3-lined summary I linked to on my blog? I liked the 3-line summary--that pretty much sums it up. The ending...well, I didn't really enjoy this book too much. To me it didn't seem realistic or even something that people would possibly allow to happen--the whole concept. But I guess it was supposed to be over the top. I was surprised about O'Brien. I do think Brave New World is better and to me seemed more plausible than this one, but I can see what he's saying in this one too. I'm checking out We by Yevgeny Zamyatin, which is, according to the essay in the back of my copy of 1984, supposed to be another dystopian novel around the same time period, sort of an equal to Orwell. Part of a trilogy of dystopian literature with 1984 and Brave New World. Orwell was a life-long socialist, and actually, that's what made him such an excellent critic of Russia. Socialism in the mid-20th century was split, more or less between what was then called Leninists and Trotskyists. The Leninists believed in the Revolution, in Russia and China, later, believed that the head of the great eventual revolution of the proletariat that woud create a beautiful new society had already begun, in the Russian Revolution. The Trotskyists believed, again more or less, that the revolution had been perverted by Lenin, and to a much greater extent Stalin. They believed that Russia was more or less just a big ol' dictatorships, a fascist state more or less, particularly with the Cult of Personality around Josef Stalin. THIS is what was wrong, the oligarchy seeking to suppress the proletariat. True Marxism, if you go back and read it, said that the proletariat must lead the revolution through it's entirety. The idea of a Communist Party seperate from and in charge of the Proles was a refinement made by Lenin. Lenin originally preached, more or less, that the party would eventually grow to contain all of the people of the world, and then we'd all live in one Utopia, as people were led from the chains of the past into the glorious new future. Stalin, on the other hand (IMHO) believed, more or less, that Socialism was a good excuse to get money, and get laid. And kill people. For fun, you know. The Trotskyists were more traditional marxists, maintaining the belief that the people would rise to free themselves from their chains, and the people would rule themselves. Trotskyism, and Marxism in general, does not, for instance, preclude Democracy, and you see the Democratic Socialist movements of Europe (basically Trotskyism, sans revolution) as a powerful force all the way through the cold war. Basically, then Orwell believe in Socialism, and believed that Russia was just a Totalitarian state with a red flag with some pretty symbols on it. Or, the simplified version that Jason gave me: "Orwell was a socialist, and he thought that Russian communism was nothing more than totalitarianism in disguise." That statement makes the whole book make a lot more sense to me. I have a very concrete, rather than an abstract, way of looking at it. Mandy, it's interesting that there were so many dystopian novels right around the same time period--there must have been a lot of social unrest. Jason, I did not know all of that. So, do you think this was primarily an anti-Russia book? Actually, Dystopian lit really began, in it's modern form in the late 19th century, with people like Jack London, Jules Verne, and HG Wells (though I have to give a quick nod to WH Auden, about 10-15 years after, who wrote a GREAT short Dystopian story, called 'The Machine Stops'. 3) The rise of Russia, the worlds first successful social revolutionary state, to the position of a superpower. By this time, you started to see history through the eyes of the early cold war - a battle between two forces, the force of homogenizing, McCarthyistic, rich-enriching and poor-robbing Capitalist Imperialism, and the force of homogenizing, Stalinistic, rich-enriching, poor robbing Communist Imperialism. The irony of it, from someone like Orwell's point of view, was that both promised some sort of equality and power for the starving masses, and neither really seemed to care about the poor, short of as tools in their global power-play. Dystopian literature reflects this - the oligarchy becomes so entrenched that it's almost untouchably distant, revolutionaryism is quashed by the complacency of new opiates for the masses - jingoism, television, mass-market media. People become cogs in a new type of machine. Revolution, which created all the potential of the 20th century, was being twisted into a method of consolidating the power of the priveliged few. What Orwell and many others did not foresee was the rise of Anticolonialism and Seperatist Nationalism, that took the mantle of revolutionaryism in the late 20h century, and used it to disrupt the great superpowers. We talk about the United States, like we won the cold war, but we didn't. The cold war was won by states like Afghanistan, all we did was send money and Jingo pamphlets. We definitely need to find a babysitter so you can come to this book club, Jase.